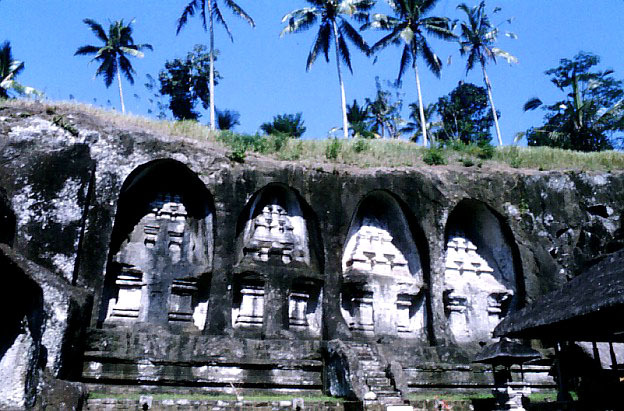 Then we were off to Gunung Kawi, the Rock Temple of the Ancients, near Tampaksiring. 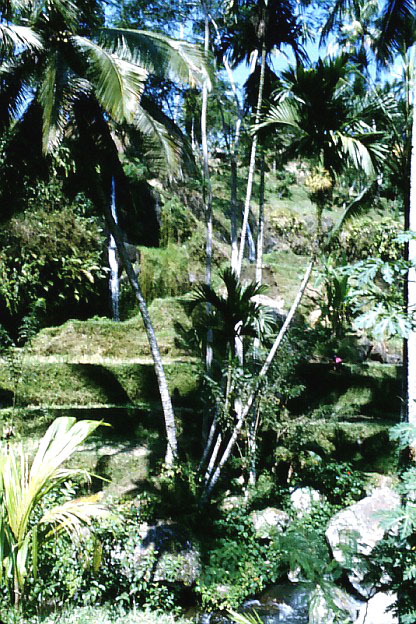 The countryside here is gorgeously lush, and the footpath down to the temple passes through breathtakingly beautiful rice terraces. Here are some views from the footpath which leads from the road down to the temple, which lies at the bottom of a valley. 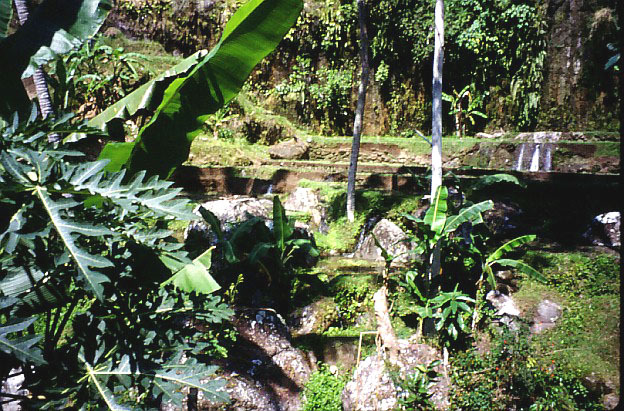 You could hear the sounds of water trickling along the irrigation channels. 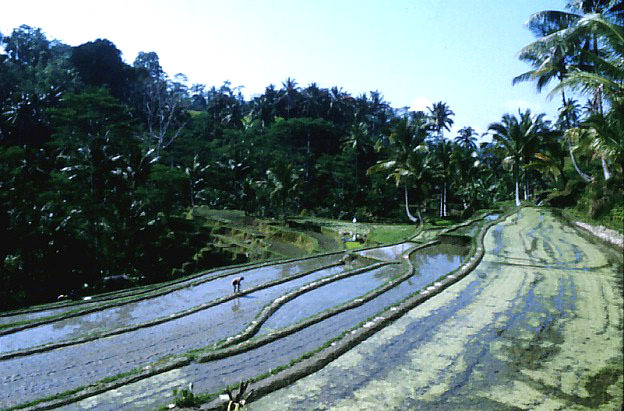 These rice fields were near the bottom of the valley. 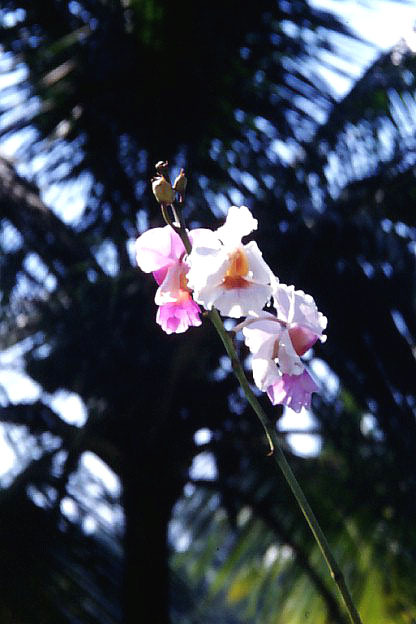 It was so tranquil here, silent, but for the sound of the occasional farmer tending his rice field. 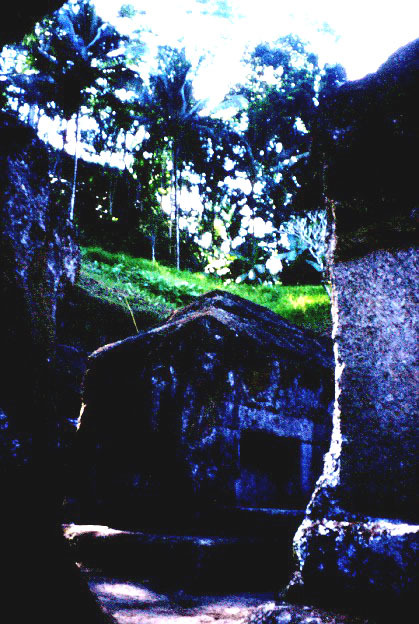 The ancient temple of Gunung Kawi, with huge niches carved out of the living rock. The temple dates back to the 11th century. A little further along the footpath is a beautiful temple, still very active, with lovely rock carvings and a fabulous carved Garuda bird perched in the roof of one of the pavilions. 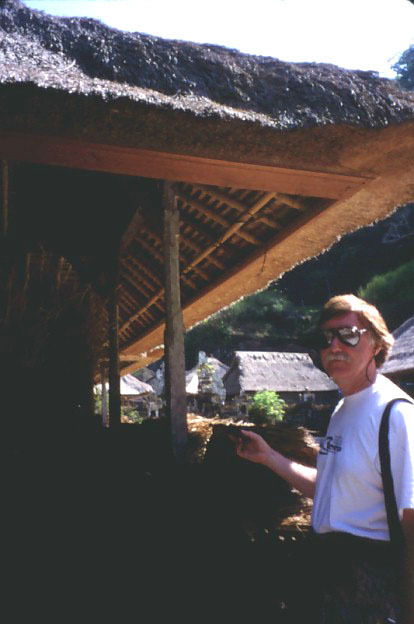 Here I am examining the black roof thatching material, which is made of the hair-like material from the coconut palm, that grows just below where the leaves sprout from the trunk. 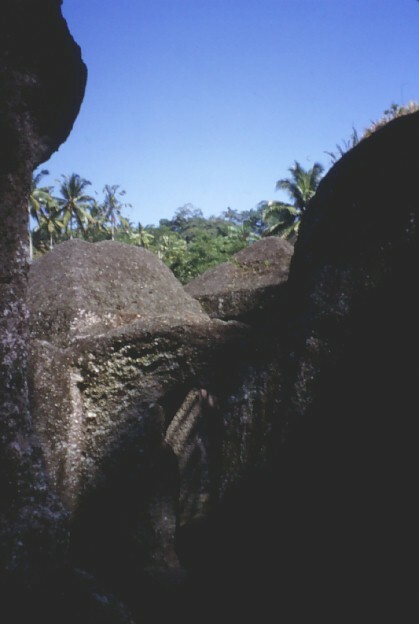 Off the temple are more ancient niches and what the guide-book described as an ancient monastery - but very small, and all carved out of the living rock. There was a sign to a waterfall, so we followed the path along a narrow ridge between two rice fields. 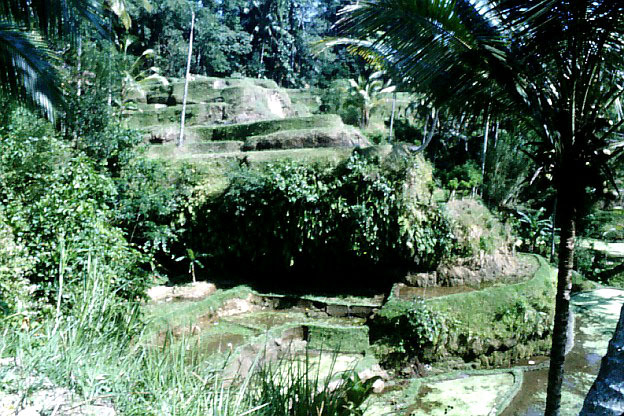 Everywhere, rice terraces rise above us and a pretty stream gurgles below. 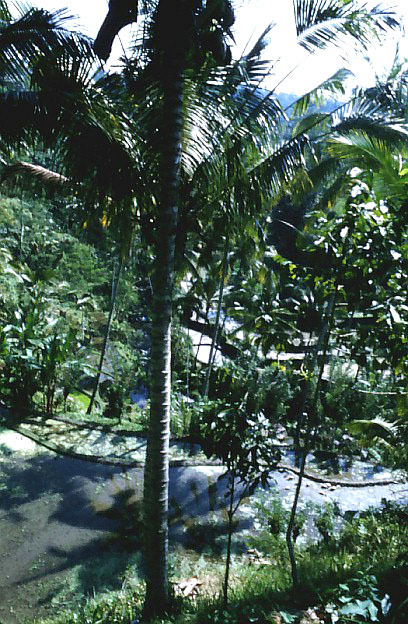 Palm trees everywhere, and the occasional farmer spreading out the mud ready for planting. It's impossible to capture the beauty of this place on film. 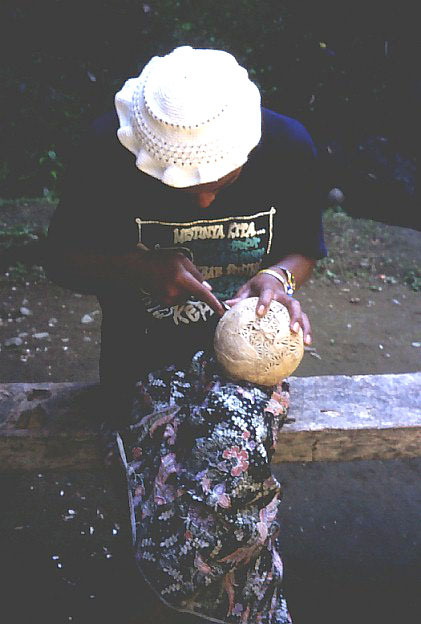 This villager was sitting outside his house, carving a coconut in elaborate designs. On the way back up the footpath there were quite a few Balinese selling craft items. We ended up buying a beautiful carved wooden panel depicting a Barong and gamelan players to go over the front door of our house back home, as well as a beautiful tablecloth, all for a few dollars. 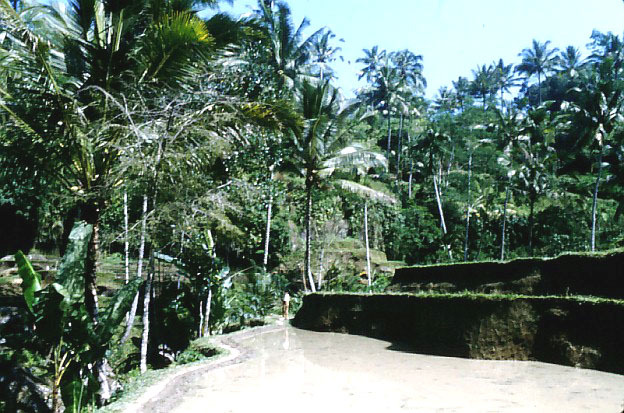 This was one of the most beautiful places we visited in our entire time in Bali. I could easily imagine living here in utter peace and tranquility.